It is nine o’clock in the morning. 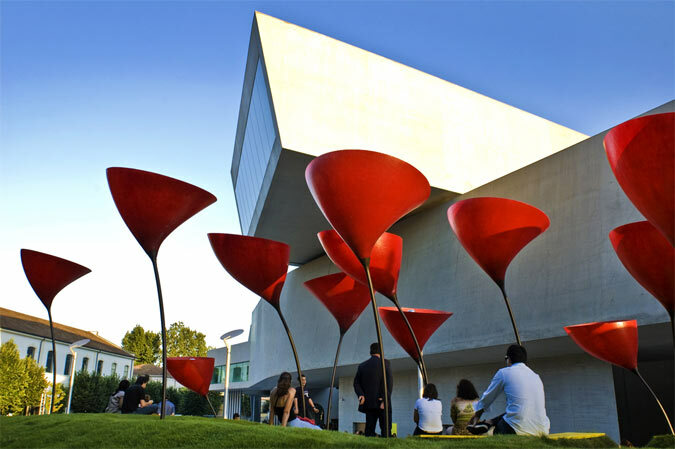 The sky is blue, and reddish giant plastic poppies highlight MAXXI’s curved concrete walls. This is not a line from a Beatles lyric, it is the WHAT-AM-I project designed by stARTT, acronyms of a collective of young Roman architects founded in 2008 by Simone Capra and Claudio Castaldo, with Francesco Colangeli, Andrea Valentini and Massimo Brizzarielli as late entries. WHAT-AM-I is the winning project in an open competition commissioned by the MAXXI museum, the first Italian edition of the established Young Architects Program with Pio Baldi, Margherita Guccione, Anna Mattirolo, Barry Bergdoll, Pippo Ciorra, Maristella Casciato, Mario Nanni as jury. In sharing with twin NY’s MOMA event, the brief requested a temporary installation encouraging people to use the esplanade ahead of the Hadid building. Initially conceived to cross the public space linking two sides of the Flaminio district – via Guido Reni and the Tiber riverside – this large outdoor area is now enclosed by two heavy metal fences. These barriers, controlling human fluxes foreign to the museum’s activities, paradoxically keep the building away from Roman citizens. Considering that one of the main themes of contemporary art is to involve the user, you can see the big mistake. It is nine o’clock in the morning and the museum is still closed. It opens its barbican at eleven, but behind the grille fence I notice workers upon artificial meshes. Among them I identitfy one who could be Simone Capra—from his alternative suit. He seems scared when I ask him for information and replies that Francesco Colangeli is the man for interviews. Francesco meets me, opening the fortress’ barbican. Finally I am able to reach MAXXI’s inner sanctum and sitting there he gives me some bits of information about the plastic poppies and its mobile platforms. He introduces an installation based on a dissected map of John Spilsbury—one of the first geographical map puzzles, made up of pieces divided geographically by coasts and lines of mountains. To accompany this literary concept from the distant 18th century, stARTT’s project composes a tectonic puzzle with stray grass islands flowing over MAXXI’s concrete outdoor pavement. They declare their intention to blend Hadid’s “hard, hygienic and monochrome” piazza with stARTT’s “softer, racy and colourful” living space. In this way, synthetic grasslands and some gay plastic flowers would seem to redeem the concrete curse that binds the plaza. But is it the right way? Is it possible to solve an urban fault setting a funny stage as a relief? This formalistic approach recalls Baroque scenes in Spanish cities that hid urban tragedies with the gorgeous facades of the powerful. All this seems surprising reading that one of stARTT’s missions is to manage the transformation processes that affect human activity space while avoiding formalistic approaches to design. But here, where in this project is the critical standpoint? The missed opportunity of people participation? Can some colourful spots redeem architecture’s failures?